I’m always very excited when a new brand comes into town, especially when it’s a brand from the H&M group, which already includes COS and &Other Stories. Arket is the place-to-go for timeless pieces, must-haves on your wardrobe regardless of the last trend. The products in the store are organized by colors which is eye candy. The brand is a mix of COS aesthetics and prices with Joseph design, in all the colors you can possibly imagine. Sustainability, durability, and quality are at the heart of Arket and you can see that not only in the store but also online. They bring a new and fresh concept that seduces me by this calming and educative effect. The store architecture reminds me the industrial era, with plenty of grey and space to see everything calmly. After the visual impact, you can be seduced by the yarns they use in different clothes and to be inspired to organize your closet by colors when you get back home. 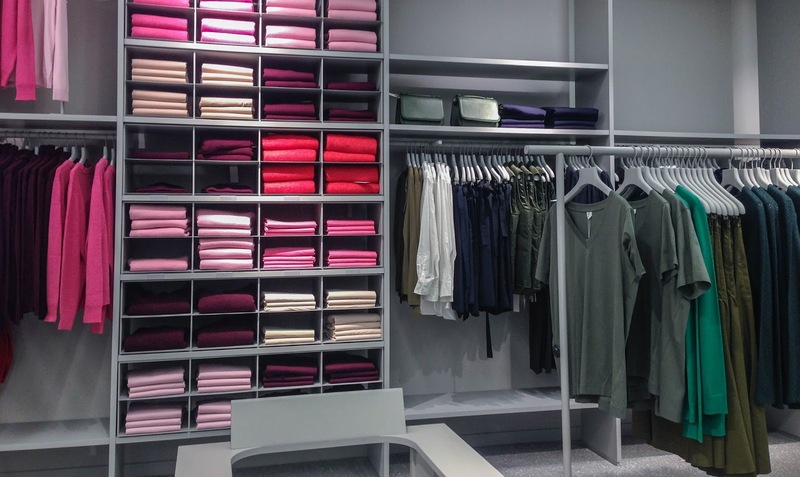 Differently, from other brands, you will find menswear on the ground floor and womenswear on the first floor. You can also sit down in a cafe to appreciate an organic coffee or get a few bits and bobs for your house. Lançamentos são coisas para me deixarem muito animada, por isso quando descobri que uma marca nova estava para abrir a sua primeira loja em Londres podem imaginar o quanto entusiasmada fiquei, especialmente sendo uma marca do grupo H&M, que já inclui a COS e a & Other Stories. Na Arket encontram peças intemporais, must-haves no vosso guarda-roupa, independentemente da última tendência de moda. E para delícia dos nossos olhos, os produtos na loja estão organizados por cores. A marca é uma mistura da estética e preços da COS com o design da Joseph, em todas as cores que consigam imaginar. Sustentabilidade, durabilidade e qualidade estão no coração da Arket e comprovam isso não só na loja, mas também no online. A Arket traz um conceito novo que me seduz por ter um efeito visualmente calmante e educativo. A arquitetura da loja fez-me lembrar a era industrial, muito cinzento e espaço para ver tudo com calma. Após o impacto visual, podem perceber os diferentes tipos de fios que eles usaram nas diferentes malhas enquanto se inspiram para organizar o vosso armário por cores. Ao contrário da maior parte das lojas, encontram as roupas masculinas no rés-do-chão e a secção feminina no primeiro andar. Também se podem sentar a tomar um café orgânico ou comprar algumas coisas para a casa. As the knitwear I’m showing you here was sold out on my size, I started my journey on the Arket‘s website to see if they had my size. I was surprised by the fresh engagement they give to the user, do you know why? On their e-commerce, you can filter their collections by the country where it was produced, department, color, pattern and material. In some products page, you can get to know the factories, know more about the material or even the product’s history. I will prepare a new article about this topic but I believe it is so important to know how your clothes are being produced and that no children produced what you are wearing. Monday I will leave you with a selection of 7 pieces that could work as a capsule fall wardrobe. de peças que poderiam funcionar como um armário cápsula. You must be <a href="https://ararapintada.com/wp-login.php?redirect_to=https%3A%2F%2Fararapintada.com%2F2017%2F09%2Farket-go-shopping%2F">logged in</a> to post a comment.